Before we get into today’s post, I have to recount a story that will help explain why this post is titled as such. 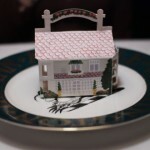 The first time we ever dined at the Inn at Little Washington was exactly one year ago. Rachel and I had just got married and we went on a “mini-moon” in Washington, Virginia immediately following the wedding. Staying at a nearby bed and breakfast, the main attraction was our reservation at the world-renowned Inn for dinner. As someone who not only loves food, but is also considered a “bottomless pit” to some, what happened next was, dare I say, tragic. That morning, I had contracted some sort of stomach illness. Any desire of hunger had disappeared, replaced instead with sharp pains in the abdominal region. It wasn’t really the greatest trade off. Since we were mere walking distance from the restaurant, and because there would be a cancellation fee for reservations changed within 24 hours, I felt that I could whether the storm and try to enjoy dinner to its fullest. While I recall the deliciousness of the herb-crusted baby lamb Carpaccio, once I had reached the second course, it was all downhill from there. The pain was intensifying and the sight of food was increasing my nausea. The waitress, who felt terrible about the predicament, kept graciously supplying me with glasses of ginger ale. I barely touched my entrée and had no recollection what it tasted like because I was so ill.
As someone who rarely gets sick, this was my worst nightmare realized. 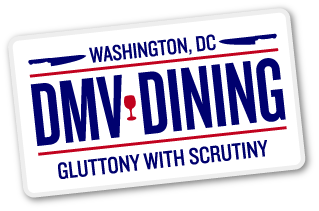 Ever since that fateful evening, I have vowed to return to the Inn at Little Washington not only healthy, but with a hearty appetite. It’s eaten away at me (no pun intended) for a year now, and I was determined to come back and enjoy the best dinner we was supposed to have that night. With our one year anniversary coming up, we felt it was a perfect opportunity to return to the countryside of Virginia and dine at one of the area’s (if not the country’s) very best restaurants. 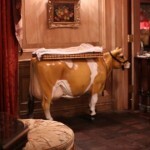 The service at the Inn is unlike anything else we have ever encountered. When we arrived in the pouring rain, attendants came with umbrellas to make sure we wouldn’t get wet from the nasty weather. Once we were inside, one of the hosts noticed my camera and asked if he could take a picture of us in front of the warm fireplace, to which of course we obliged. Shortly after, we were escorted to our seats in the gorgeous dining room where another host asked us if he wanted to take our picture at the table. 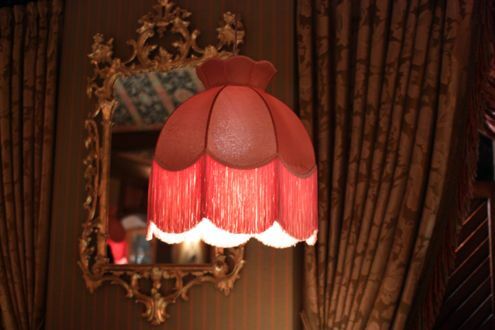 To say that you are treated like royalty would be an understatement when dining at the Inn. We started the evening off with a bottle of chardonnay from the Winery at LaGrange, which is a winery we had debated visiting this past weekend. Shortly after our wine was served, our first amuse bouche arrived. 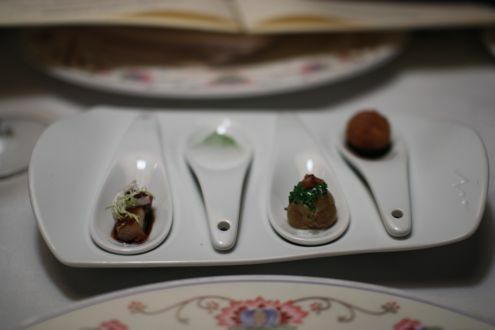 Delicately placed in four individuals spoons were miniature bites of pork belly, “gin and tonic” foam, the smallest baked potato with sour cream, and a risotto ball. We obviously couldn’t share them so we each ate two. 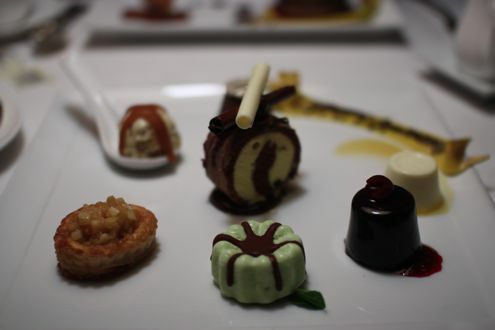 For such small portions we were enamored with how each tasted. 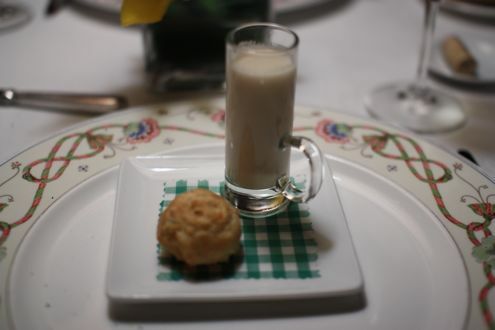 Our next amuse bouche was a small serving of white bean soup prepared with Virginia country ham and accompanied with a cheddar biscuit. The two items flawlessly complemented one another. In fact, I wouldn’t have minded a whole bowl of the soup just for myself based on how rich and delicious it was. 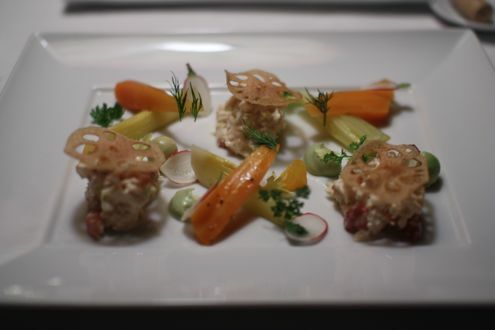 For the first course, I ordered the chilled Maine lobster with braised celery hearts, root vegetables, and citrus vinaigrette. The lobster knuckles were just as exceptionally good as the beautiful presentation. While it slightly reminded me of the lobster meat found at Red Hook Lobster Pound (yeah yeah, I’m well aware I’m referencing a food truck, but come on, their lobster meat is undeniably good), head chef Patrick O’Connell finds a way to take something and make it that much better. The orbs of avocado were also a really nice touch and melted in my mouth with each bite. Rachel decided to get the Carpaccio of herb crusted baby lamb with Caesar salad ice cream, and we both agreed that it was one of the prettiest dishes we had ever seen. 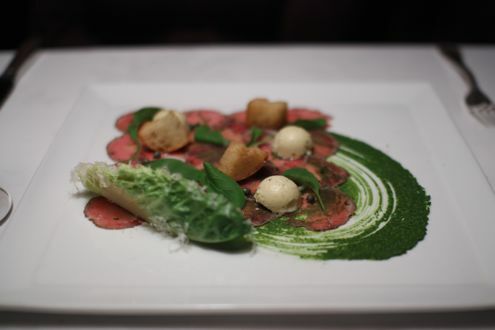 It seriously looked like a painting, and the combination of the miniature ice cream balls, Carpaccio, homemade croutons, and spear of romaine lettuce with fresh cheese made each bite a perfect play on a classic dish. 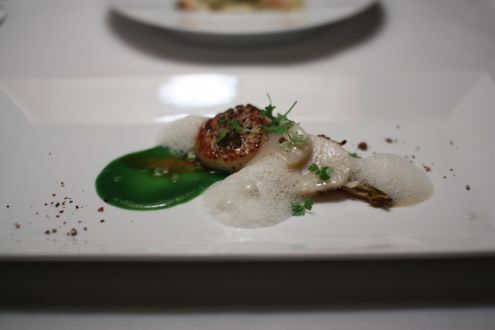 The second course featured a seared sea scallop with leek puree and caramelized endive. While the scallop was impeccably cooked, I have to admit, I was slightly disappointed by the size of it. Don’t get me wrong, it was a very enjoyable piece of shellfish, but for the price we were paying, it’s a shame that it could not have been at least a somewhat larger portion. The way it was prepared, however, made me savor each bite more than I would have with a larger plate. Always a fan of anything lobster, Rachel got the lobster fricassee for her second course as I had lobster for my first course, not to mention that she had the lobster entree during our visit last year. 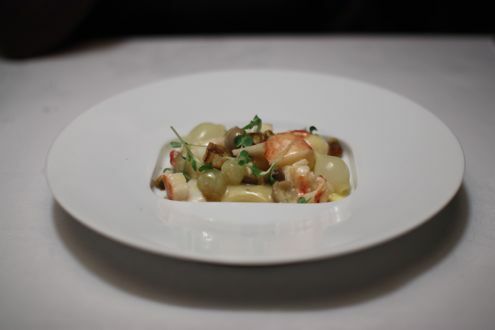 This is one of the Inn’s characteristic dishes, and once you put all the components on your fork, you get to relish a perfect bite of lobster meat, gnocchi, walnuts, and stem mushrooms in a light butter sauce. It’s a dish that could be very filling if you had a full plate of it, but the portion size was perfect as a prelude to what was to come. As for the entrée, it was only a matter of time that I would face the dish that simply teased me when we last met a year ago. Having no memory of what it tasted like, I wanted redemption on one of Patrick O’Connell’s classics: the pepper crusted tuna pretending to be a filet mignon. Topped with seared duck foie gras on charred onions with a burgundy butter sauce, this dish met its lofty expectations immediately after the first bite. 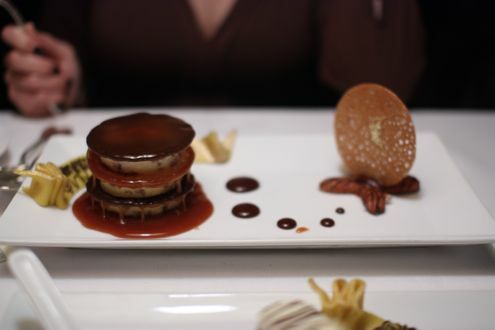 Not only is the quality of the fish top-notch, but then when you add in the fact that you’re also having the most savory piece of foie gras your taste buds have ever encountered, you are in for quite the treat. What is amazing is that you really do lose sight that it’s not beef you’re enjoying, but rather tuna. 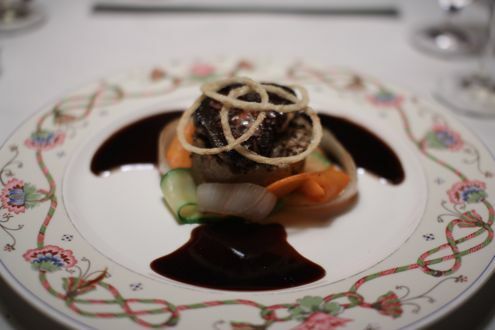 Between the outstanding cut of fish, foie gras, and burgundy sauce, it’s a recipe that has stood the test of time. When I finally put the fork down after the very last bite, I ultimately reached the feeling I had been yearning for so long: closure. After some debating and suggestions from our ever-patient waiter, Rachel decided to steer clear from her usual choice of fish and get another Inn classic – the beef two ways. 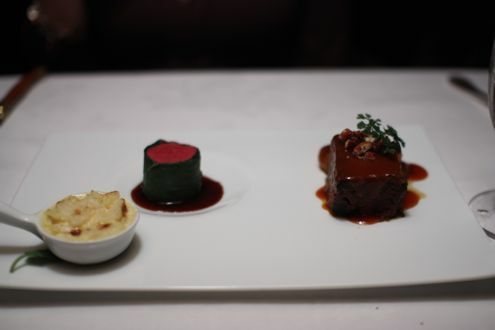 The two versions of meat were striking in contrast on the white plate. On one side, you had a braised short rib that was slow-cooked for hours and fell apart with the touch of your fork, and was accompanied by a delicious barbecue sauce that was sweet but not overpowering, along with mini walnuts and vegetables. 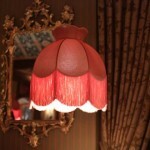 On the other was quite possibly the most delicate piece of meat we have ever tried. It was a miniature filet mignon, cooked rare and wrapped in Swiss chard. When I tried a bite, I realized this is why people go to the Inn: to experience somewhat familiar foods in completely new ways. To top it all off, a small portion of potatoes au gratin provided even more indulgence to an already decadent dish. It very well might have been the best cut of beef I have ever tasted. Nearly stuffed, we still had to order dessert! After glancing over the menu, I opted for the Seven Deadly Sins: a sampling of seven of the Inn’s richest desserts. When it arrived, I was not only floored by the presentation but also by the wide range of pastries found on the plate. If memory serves me correctly, it included an apple crisp, molten chocolate lava cake, panna cotta, a scoop of butter pecan ice cream, black forest mouse, mint chocolate cake, and a vanilla chocolate ice cream roll in the center. Unfortunately, I could only tackle six of the seven desserts (rest assured, the apple tart is in the refrigerator). Nonetheless, I was very satisfied with my choice. You have to tip your hat to the staff at the restaurant. They go above and beyond in insuring that your experience at the Inn at Little Washington is one you will never forget. For instance, our waiter noticed that Rachel had only a few bites of her butter pecan ice cream sandwich with hot caramel sauce. He asked if she liked it, and as soon as she hesitated, he promptly asked what she would like instead. Moments later, a fresh plate of bread pudding appeared on the table. He could not have been more gracious. 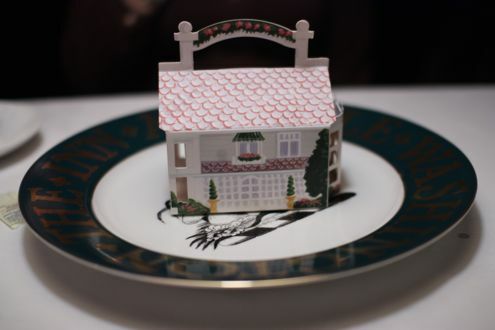 After we settled the bill and received our personalized menu to take home along with a miniature version of the Inn filled with treats, we learned via The Bethesda Foodie that you could ask for a tour of the kitchen. We grabbed our waiter’s attention, and before we could even finish our question, he already knew what we were going to inquire about. One of the hosts soon took us to the back, and before we knew it, we were inside the Inn’s kitchen. As we were whisked inside the heart of the operation, Chef O’Connell himself greeted us, shook our hands and wished us a happy anniversary! We thanked him for providing such a great meal while our host showed us about the different stations. Before we knew it, we were outside the kitchen, starstruck. It didn’t even occur to us to ask for a picture with the Chef, but he did look extremely busy and we were grateful he took a few minutes out of his busy schedule to meet us. We’re sure we weren’t the only people who asked for a tour that night. Finally, it was time to go. Happily full and content, a hostess already had our coats ready at the door and a valet was warming our car for us before we ventured out into the sleet and rain. 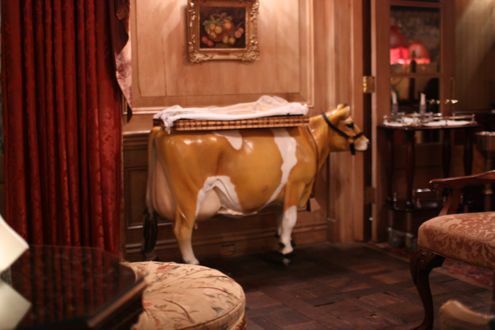 If you’re ever thinking about going out to dinner for a very special occasion, we cannot recommend the Inn at Little Washington enough. Between the food, ambiance, and customer service, it’s not a meal, but rather an experience – one that you will treasure for a long time.